Battery efficiency is important in a van, and your fridge is one of your highest house battery consumers. Here are some ways to make sure your fridge runs as efficiently as possible. The first step is obviously choosing an energy efficient model, but there are also tricks during installation and use that will make the fridge more efficient. First off, don’t buy a fridge that’s bigger than you need. You should aim to have the fridge comfortably full when you use it. Anything larger and you’re just cooling air unnecessarily. Having said that, we bought a large fridge – the TruckFridge TF130 – and because we like to take our food with us rather than eating out all the time, we fill it completely when we’re traveling for three or more days. Most of the time though while we’re home it just sits pretty much empty. That’s a lot of space to cool for no good reason. Top or front opening door? Top-opening (chest style) fridges are typically slightly more efficient than front-opening ones, but they are harder to build in to a cabinet because they need space above them so you can dig around inside them. Some people put their top opening fridge on runners so that it slides out from a cabinet area. The big benefit of this chest style of fridge is that they are typically portable. You can take them out of the van and use them wherever else you might want them. The front-opening fridges are much more like the one in your kitchen. The thermostat controls will be inside the fridge, and it’ll most likely have a light to help you see what’s going on in the mayonnaise jar hidden in the back corner too. Most have shelf space in the door that’s suitable for beverages. There are also drawer-style fridges. These are similar to front-opening ones in that you build them into a cabinet, but their construction means their storage area is a little more like the top-opening style fridges. What type of cooling system? There are three main types of cooling system in fridges: compressor style, Peltier effect, and absorption (propane driven). Peltier effect fridges use electricity to move heat from the inside of the fridge to the outside across a solid state junction. They have no moving parts. Instead, they just use the magic of semiconductors. You can often find these sold for car camping by companies like Coleman, Igloo, or Koolatron at around the $100 mark. They work OK but they aren’t really efficient, and they can only reduce the temperature about 35 degrees from ambient. So, if it’s warmer than 70 degrees Fahrenheit outside, the fridge won’t be able to stay cool enough to keep your food safe. Because they’re built like a cooler, you can always add ice to this type of fridge to help it stay cold. That seems like cheating though. Your fridge at home most likely uses a compressor. It moves coolant around some pipes inside the fridge where it picks up heat and carries that heat to the outside of the fridge. DC compressor fridges (made by Indel, TruckFridge, ARB, Vitrifrigo, Dometic or Whynter for instance) are specifically designed for 12v use. They use compressors driven by 12v motors, and have the right amount of insulation for use in a vehicle. They aren’t cheap though. Prices range from $500 to over $1000. These fridges tend to come in both built-in (front door) and chest style. After seeing the price of DC compressor fridges, you might be tempted to use a dorm style fridge instead. These fridges are normally really cheap. However, there are a couple of issues. They aren’t well insulated, their compressors aren’t very efficient, and because you have to run them from an inverter you’ll be wasting anything up to 20% of your energy just converting from 12v DC to 120v AC. So although they cost less, they’ll use a bunch more power to run. If you have propane, you might be considering a propane fridge (SMAD, Norcold, Dometic). Because it uses a different energy source, it would definitely help with battery efficiency (although the propane fridges still use some electrical current) but the heat exchangers in propane fridges aren’t as good as compressor-driven electric fridges, the propane must be vented to the exterior of the van, and the fridge must be kept level to work properly. Their cooling units take up more of the volume of the fridge than a DC-only version would, so there’s less space left for food. There are times when you have to turn the propane off and rely on the fridge’s less-efficient DC or AC cooling systems instead. The added complexity and lower reliability of these fridges mean they are probably not the best option for an adventure van. The way you install your fridge can make a big difference in how much power it uses. Assuming you’ve bought a compressor style fridge, the coil needs airflow so that it can get rid of the heat it generates. The fridges come with a fan. You can add an extra fan if it helps move more air across the coil, and some people even create a vent to the underside of the van just to move more cool air in to the coil area. Mostly, it is just important to follow the manufacturer’s instructions about how much air flow is necessary to ensure good cooling. All fridges have a layer of insulation. But it’s possible to add more. PolyIso foam board in anything from 1/2″ to 2″ thicknesses will help reduce the flow of heat from outside to inside the fridge. The door is harder to add insulation to, but we managed to place a 1/8″ layer of Low-E foil faced foam behind the fascia panel in the door of our fridge. At least one manufacturer’s instructions warn about additional condensation issues if you add foam to the outside of the fridge unit, but it’s hard to know how adding close-fitting foam boards would create a condensation problem. If you really want to reduce your fridge’s draw from your battery, Indel make a replacement thermostat that works on both their own Isotherm brand products and the Truckfridge models too. It’s a digital device that detects when the fridge is running on AC or when the battery is charging and puts the fridge into a cold storage mode where it cools to a lower temperature than usual. Then, when the fridge is running on the battery it doesn’t need to work as much to maintain its regular temperature. The replacement thermostat unit is expensive – around 1/3 of the price of a Truckfridge – and it’s unlikely to work well for LiFePO4 batteries because they have a higher resting state voltage which might trick the thermostat into thinking the batteries are being charged. Of course there’s always the manual version of this thermostat. You can turn the thermostat setting colder when you are on shore power to store the cold for later. When you go off on a trip, you’ll be loading your fridge up with a whole bunch of food. Here are some tips for helping your fridge cope. Only add food that is already cold. 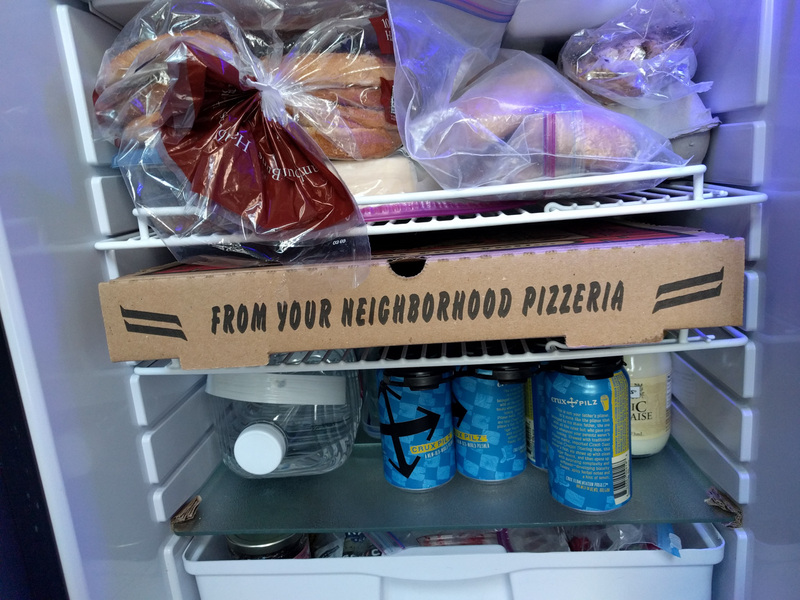 Cool it in a house refrigerator first. If you will be away for several days and you make your own food, freeze it in portions and leave those in the fridge. Bolognese, soup, lasagne, etc. all freeze well and will help the fridge stay cold. Let cooked food cool before refrigerating (within the realms of food hygiene though). Getting it down to room temperature outside the fridge means the cooling mechanism doesn’t have to work so hard. If you’ve got food that is still steaming and you absolutely have to put it in the fridge, cover it. The moisture will condense out over all the other items in the fridge. Label the stuff you put in the fridge in take-out boxes or Tupperware. That way you know what’s where and you can grab it fast, rather than leaving the door wide open for ages while you browse around. There’s a theory that if you keep the fridge full, like with gallon water jugs, they will act as thermal mass. That’s not necessarily helpful. These folks agree too. The fridge might cycles on less often, but it needs to work harder each time it cycles. In the end, it’s a wash. Using empty jugs might work because it’s basically making the volume of free-moving air in the fridge smaller. Check the internal temperature, and adjust the thermostat if necessary. You may even find the fridge is colder than normal when it’s filled up. Keep the door closed. Opening it obviously lets the cold air that’s inside come out. Clean the door seal regularly. If the fridge can’t seal up, it can’t stay cold. Defrost the fridge whenever there’s appreciable ice buildup on the element. Ice is an insulator and it’ll stop the element from cooling the fridge as efficiently as normal. Keeping the door closed means having the contents organized and accessible. If you have to have the door open for a couple of minutes each time you want to fish something from the back of the fridge, it means you packed it wrong. just bought this Fridge on amazon. What all do I need to hook it up to my batteries? Charles, If you bought the Truckfridge, it comes with a short length of wire attached. The wire has a plug on the end and Truckfridge also supply the socket that fits the plug. Or you can just use two regular spade terminals. You’ll probably need some more wire to reach from the fridge to your batteries. Depending on the length of the run you might need 12AWG or 10AWG wire to prevent voltage drop. The fridge needs as much voltage as you can give it. You can either run both wires back to your battery, or just run the positive wire to the battery and attach the negative wire to the bare metal of the van chassis close to where the fridge is installed. We ran both all the way. At the battery end, you’ll want a suitable size fuse or breaker so that the wire is protected in case of any problems. I think the Truckfridge manual suggests what size wire and fuse you should use. Without knowing more about your particular setup, it’s hard to say how to connect the wires to the battery itself. Assuming you have a buss bar or fuse box or distribution panel, you shouldn’t have too much trouble finding a space to connect the fridge wires. If you don’t have a buss bar or fuse box or distribution panel, it is probably time to add one! I’m about to purchase a 12V compressor fridge for my Sprinter conversion and am interested in evaluating the options you list here in terms of noise. I’m sensitive to electronic and compressor sounds when I sleep and would be more than willing to spend some extra dollars for a super quiet fridge. Thanks for your kind words – using the site links really helps us to keep things going. We’ve not had a chance to listen to all of the compressor fridge options. Our Truckfridge uses the same Secop compressor as many of the other brands, and there are two noises it makes. One is the fan noise, which can be reduced or maybe even eliminated by swapping out the supplied fan for another one of the same diameter that’s designed for use in computer cases. We swapped out the stock fan for a quieter one. We hardly hear that noise now, but it is still there if you’re listening for it. The other noise is a higher pitched whine that comes from the compressor pump. That can be masked by adding additional insulation to the inside of the cabinet you mount the fridge in, but it’s very possible that you’d still hear it if you are sensitive to that type of thing. It might be the case that the more expensive brands have ways to reduce or remove both of these noises, but I think the compressor noise is going to be inherent to the design. You will probably be able to mask it, but not remove it completely. If you get a chance to listen to a couple of fridges before you buy, I’d suggest that you do so. Remember though that your installation methods could make a big difference in how much the noises resonate or get masked in your vehicle.